Well, Federer had looked like he had his preparation right for this US Open – starting to look like his old self in Cincinnati and, after the first couple of games, getting close to hitting the heights in a vintage performance in his third round match against Mannarino. 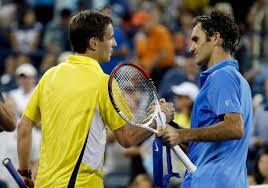 Tommy Robredo was winless against Roger in his long professional career – at 31 he’s only a few months younger. Prior to this match he had not beaten the Swiss in 10 outings, while the Swiss had not lost this early at the US Open for over 10 years, so I, like many, thought the odds on an upset were low. However, not to be underestimated with his experience and the fact that, unusually for a Spanish player, Tommy had grown up on hard courts. It represents a remarkable mental battle ground – the player who has never beaten a legend before playing him at a time when he’s looking ever more beatable. While Vitas Gerulatis famously said “nobody ever beats Vitas Gerulaitis 17 times in a row” after beating Jimmy Connors at the 17th attempt, he also famously never beat his good friend Bjorn Borg throughout their professional rivalry. However, they only played 16 times so maybe that was the reason Borg really retired! Back to Federer v Robredo – with Roger having lost early at Wimbledon and had a seemingly disastrous few weeks earlier in the summer when he was testing a new racket, he has been looking ever more vulnerable. This may have given Tommy the additional confidence needed to actually believe he could win. At the same time, despite what would seem to be incredible self-belief over the years, a string of losses to lower ranked players in the summer will have increased his sense of vulnerability. Historically, in tight matches Federer’s ratio of break-points converted from those created is poor and would indicate that, unlike many greats of the past, it’s one area of potential mental fragility. One of the best examples of this was in the famous 2008 Wimbledon final, which Nadal won 9-7 in the fifth. Roger came back from two sets down, winning the third and fourth sets in tie-breaks, however, despite playing some outstanding tennis, was only able to convert one break point in the whole match, having created 13. It would be folly to think of Federer as mentally weak, after all this is a player with one of the best tie-break win-loss records in history (of current players only Nadal has a better career tie-break record), however, it is contextual and at this level these small issues make all the difference. In all of this lets take nothing away from a fine performance from Robredo – with another over 30 player using his experience to deliver.